First & Central’s celebration of Asian Pacific American Heritage Month concludes with this post. It has been a pleasure to spotlight diverse, Los Angeles–based, Asian-American artists who deal with themes of history, language, and identity in their work. We hope you’ve enjoyed this series as much as we have. Born in Seoul, South Korea, artist and filmmaker Minha Park moved to Los Angeles to attend graduate school at California Institute of the Arts (CalArts). She now divides her time between L.A. and Seoul. In A Story of Elusive Snow (2013), completed the year she graduated from CalArts, Park explores her new life in L.A. and her longing for South Korea, or what she calls her “motherland.” She particularly misses the phenomenon of snow, which she refers to as if it were a friend—“Not her voice, or her image. I miss her physical presence.” She finds however that L.A., being the land of special effects magic and wish fulfillment, offers many unique opportunities for conjuring an experience of snow. A Story Of Elusive Snow ( 2013 ) 9min excerpts from Minha Park on Vimeo. This delightful video work tracks Park’s wistful journey to find snow, incorporating vintage Hollywood movie scenes and well-known L.A. landmarks along the way. In addition to evoking longing, nostalgia, and playfulness, A Story of Elusive Snow also expresses Park’s feeling of being a stranger in Southern California—a feeling symbolized by the incongruence of snow on Hollywood Boulevard. Most people I know of Asian descent who came of age in the 1990s have a deep appreciation for hip hop music. One of the most visible examples of this is chef and iconoclast Eddie Huang, whose boyhood is the subject of the hit ABC sitcom Fresh Off the Boat. Based on his bestselling autobiography of the same name, the sitcom repeatedly emphasizes young Eddie’s identification with hip hop as empowering music for outsiders. As Huang’s generation came of age, they began making music of their own, and today, there are many successful Asian American hip hop acts. Back in the early ’90s, however, it wasn’t so easy for musicians of Asian descent to gain acceptance in the field. The hip hop genre was heavily coded as African American, and Asians were perceived as not fitting into the culture. Attempts to perform or compose beats were typically disparaged—by audiences, by music producers, and by industry executives. In 1996, a trio of Chinese-American students at Penn State University entered a national singing contest sponsored by Sprite, and won. Their slick rhymes expressing their love for the soft drink wound up on the radio as a 60-second commercial. Executives at Ruffhouse Records—known for producing albums by The Fugees and Cypress Hill, among others—liked what they heard and approached the group for a deal. The Mountain Brothers—CHOPS (Scott Jung), Peril-L (Christopher Wang), and Styles Infinite (Steve Wei)—named themselves after a group of noble bandits depicted in a classical Chinese novel. 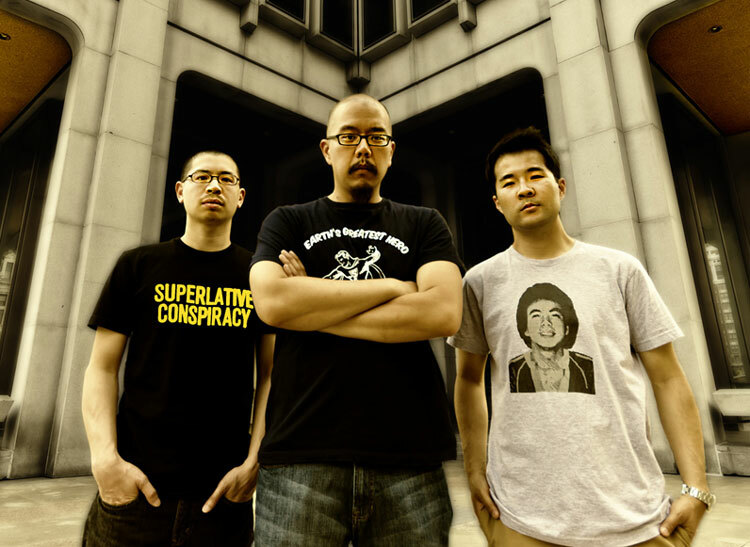 They soon became the first Asian American hip hop group to sign with a major label. Unfortunately, the group’s path was a rocky one. The record label saw their ethnicity as a disadvantage, and even suggested that they satirize their heritage onstage by wearing karate outfits and playing a gong. Although their music was critically acclaimed, it was difficult for them to get gigs if they did not initially conceal their Asian identities. After releasing only two albums—Self: Volume 1 in 1999 and Triple Crown in 2003—the group disbanded. 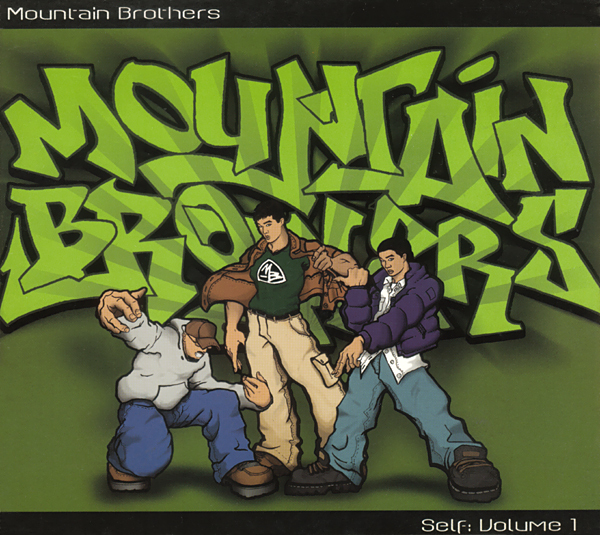 Today, the Mountain Brothers are considered important pioneers who paved the way for the many Asian American hip hop acts who followed. Although two of the members have since left music to pursue other professions, CHOPS continues to have a successful career as a producer and composer, working with artists like Nicki Menaj and Kanye West. On Thursday evening, May 14, JANM will present a rare panel discussion with all the original members of the Mountain Brothers, moderated by sociologist Oliver Wang. Come and learn more about the band’s history and what the members have been up to lately, and hear their views on the past and future of hip hop music. Tickets are still available here. Listen to some of their classic tracks here. 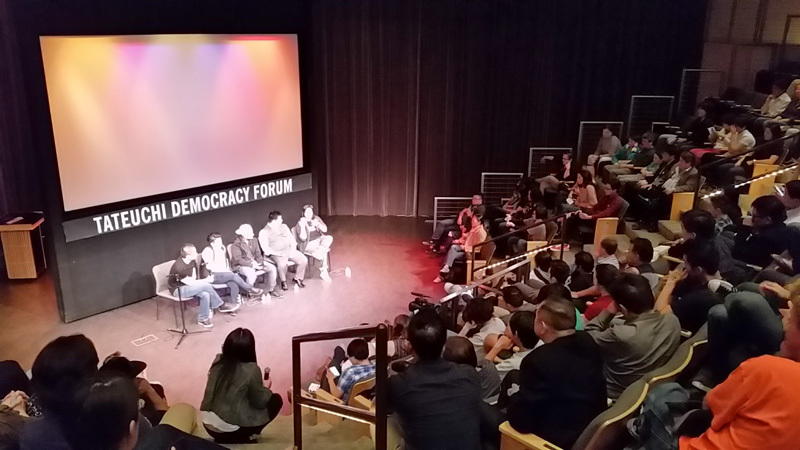 JANM’s Tateuchi Democracy Forum was packed full on Tuesday night for a special community viewing of the latest episode of the Asian-American sitcom Fresh Off the Boat. The episode featured a LGBTQ storyline, and the event drew many members of the Asian American media and LGBTQ communities. 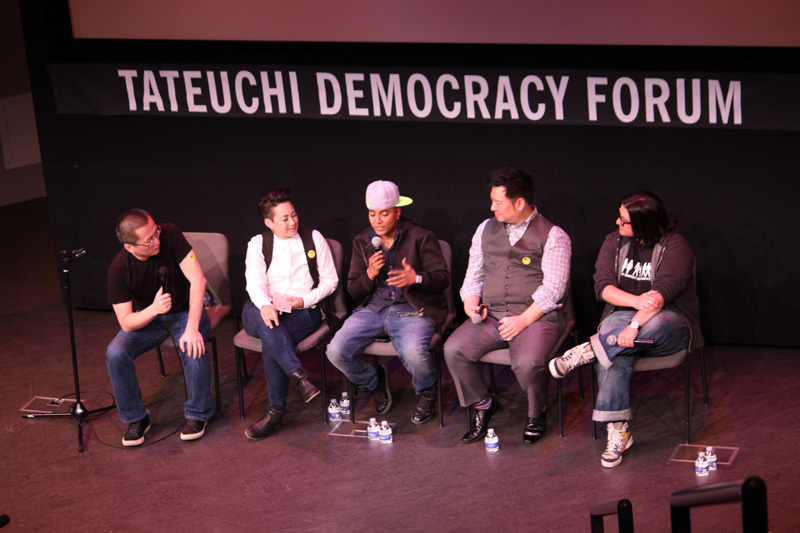 The viewing was followed by a panel discussion with writer and showrunner Nahnatchka Khan, guest actor Rex Lee, author/comedian D’Lo, and artist/organizer Erin O’Brien, moderated by filmmaker Curtis Chin. The event was organized by Jeff Yang, journalist and father of the show’s young star, Hudson Yang. L to R: Curtis Chin, Erin O’Brien, D’Lo, Rex Lee, Nahnatchka Khan. The panelists, who were all LGBTQ-identified, engaged in a lively and humorous discussion following the episode. Rex Lee, who played the character of Oscar Chow, said that his favorite thing about guest starring on this episode was getting to know the three child actors, who now send him tweets constantly. 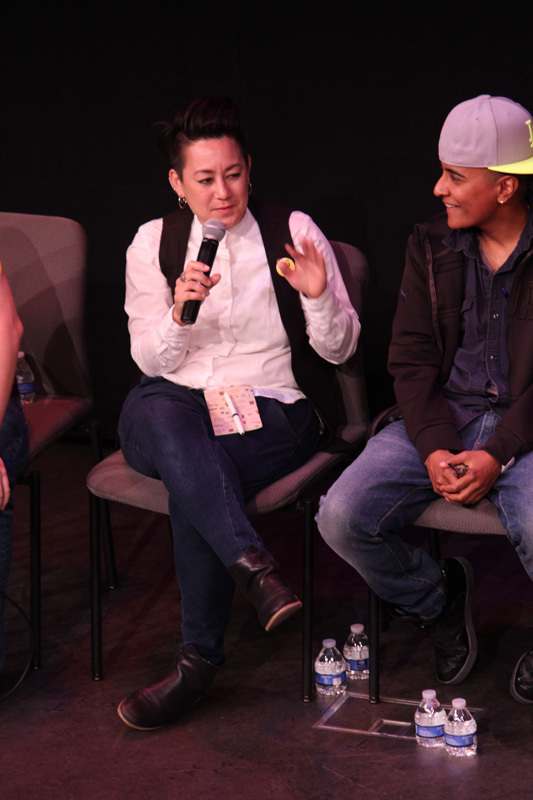 Erin O’Brien analyzed the gay subtext in Fresh Off the Boat and other popular shows, jokingly proclaiming that “everything has a gay subtext.” D’Lo, who has had roles on the LGBTQ-themed shows Looking and Transparent, expressed his preference for Fresh Off the Boat, which features people of color. During the Q&A, one audience member called out the Oscar Chow character for being “stereotypically gay.” Lee responded that as a gay man himself, he felt he was able to play Oscar from the inside, rather than via external gestures. This drew applause from the audience, who for the most part seemed to appreciate a television show capable of showcasing both Asian and gay characters with light but intelligent humor. Audience members also approved of the show’s culturally authentic details, such as this episode’s reference to “white flower oil,” an herbal remedy commonly used by Chinese families. Erin O’Brien makes an impassioned point. Photo: Richard Murakami. To watch the complete panel discussion online, visit JANM’s YouTube channel. 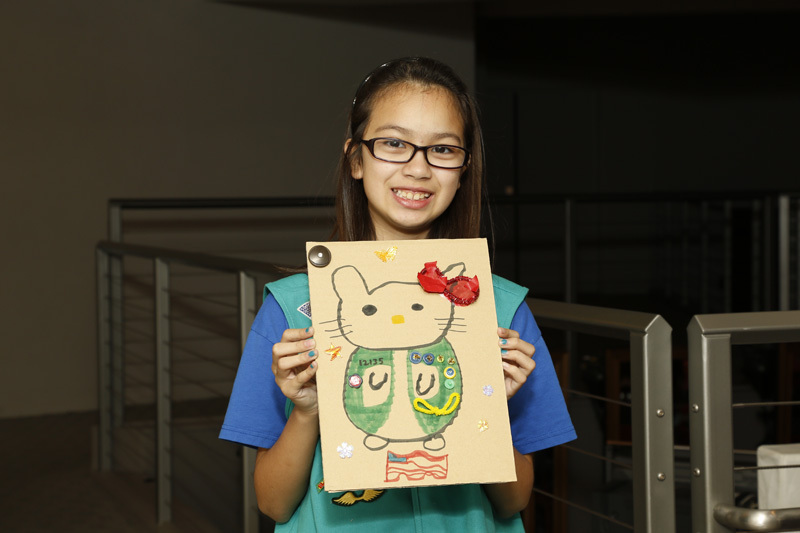 16-year-old Senior Girl Scout and Los Angeles resident Elizabeth Keller participated in JANM’s first Hello Kitty Girl Scout Program on November 22, 2014. She graciously agreed to share her thoughts on her experience. Thank you, Elizabeth! 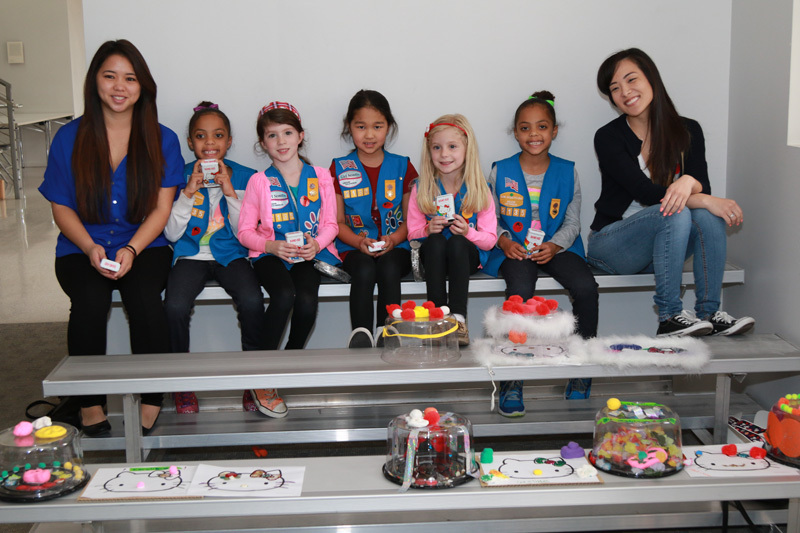 The essay is accompanied by photos taken at the most recent Girl Scout workshop, held on February 7. 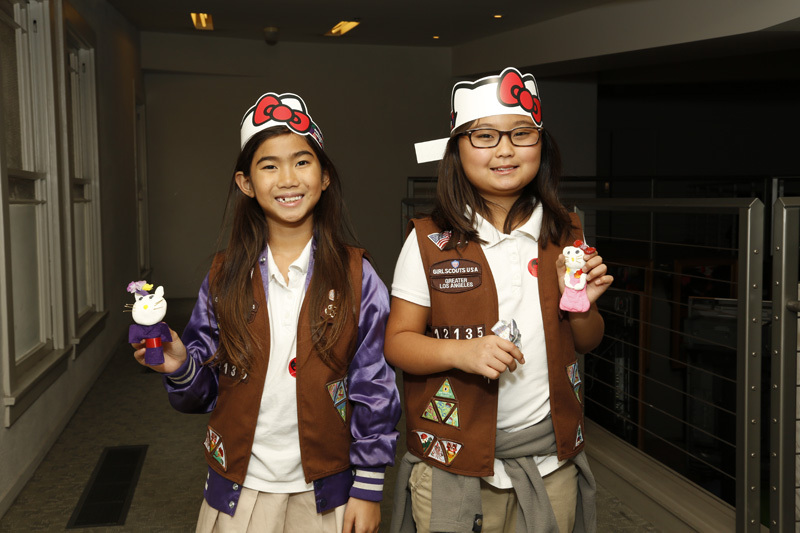 Girl Scouts visit JANM for a special Hello Kitty workshop. Photo: Russell Kitagawa. All photos taken on February 7, 2015. To me and many other girls, Hello Kitty is the ultimate symbol of femininity. Her lovely, bubbly, adorable little world full of flowers and hair bows is enchanting. And in a world where being “girly” is frowned upon, Hello Kitty reminds us not to be afraid to be our fabulous selves. Supercute World of Hello Kitty. Photo: Steve Fujimoto. 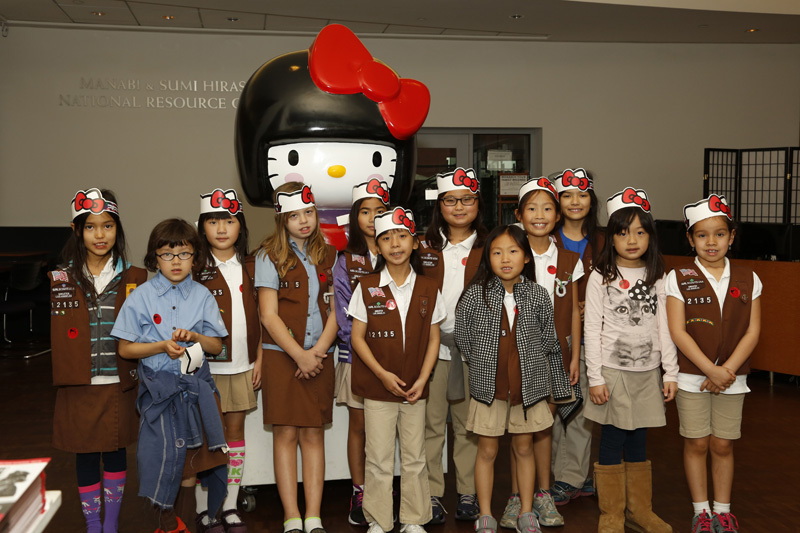 I had never considered the other aspects of Hello Kitty, however, until my Girl Scout troop visited the Japanese American National Museum’s Hello! Exploring the Supercute World of Hello Kitty. The exhibition was educational and heartwarming. I learned that Hello Kitty is five apples tall and that her full name is Kitty White. I found that I could have Hello Kitty on everything that I own—my lunchbox, my roller skates, my rice cooker, and even the braces on my teeth. inspired artwork. Photo: Russell Kitagawa. 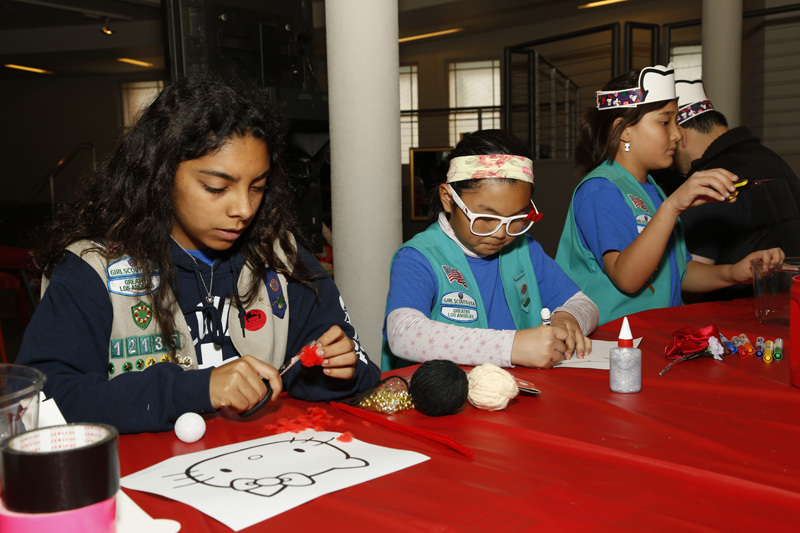 After viewing the exhibition, all the Girl Scouts completed a craft. I doodled small pictures of Hello Kitty and watched girls as young as five make beautiful art out of a character that had inspired their creativity. Looking around at more cute, pink, or otherwise charming household objects than I thought I would ever see—everything from clothes to food to headstones—it dawned on me that Hello Kitty is more than a simple little icon splashed on some toys. She represents the idea that we not only own our femininity, but that we also have the right to display it as we please. A Scout shows off her creation. Photo: Russell Kitagawa. Everything a girl does—from wearing makeup to playing video games—is seen as a call for attention, especially male attention. Hello Kitty recognizes no presence or agency except her own. She doesn’t ask anyone’s permission to be her lovely pink self; she simply is. 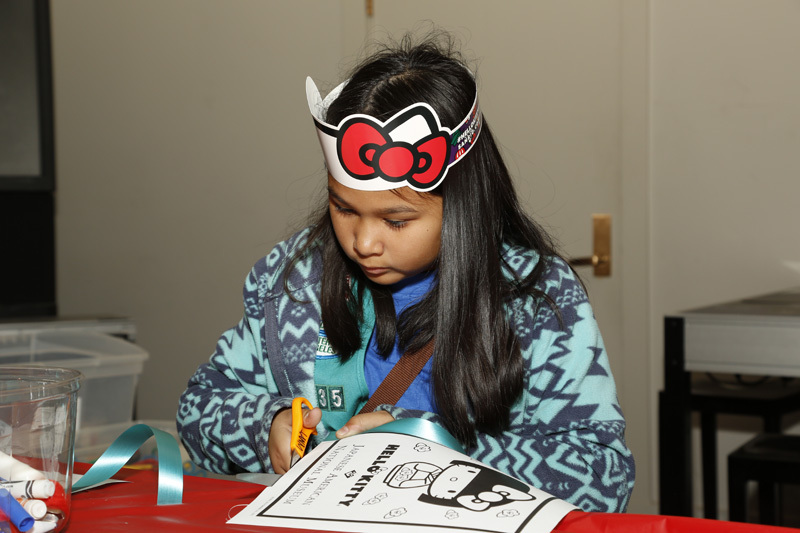 During the Hello Kitty Girl Scout Program, I saw little girls—young Scouts who are still learning about what it means to be a girl—exploring concepts presented in the exhibition, like business, foreign relations, and fashion. They learned about these things in the context of their beloved Hello Kitty. They discovered—and I was reminded—that they can do anything with their own power. And if they want to rule the world in a pretty pink dress, well, nothing can stop them. great day at JANM. Photo: Stephen Fujimoto. 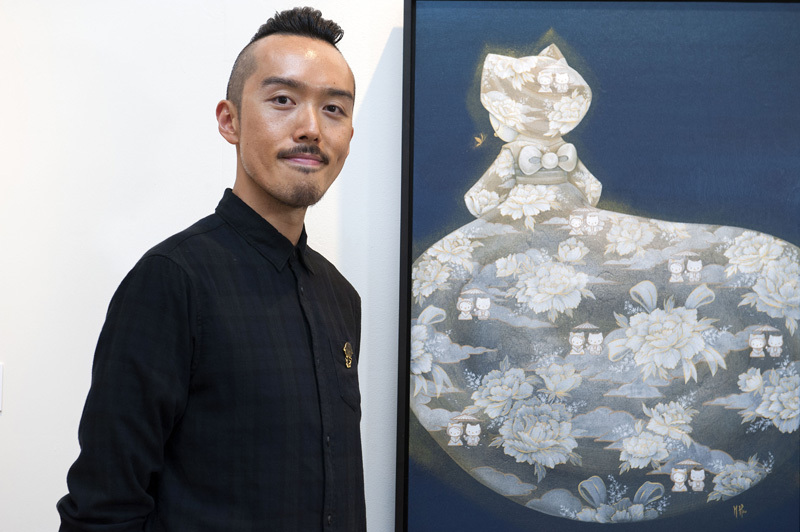 Martin Hsu stands next to his painting Hello Kitty Transcendence, on view now as part of Hello! Exploring the Supercute World of Hello Kitty at JANM. Hello! Exploring the Supercute World of Kitty has finally arrived at JANM, and people can’t stop talking about it. Check the museum’s Facebook page for links to the latest press coverage of the exhibition, including stunning photos from the exhibition’s first week. If you haven’t seen the show yet, be sure to buy your advance tickets online. 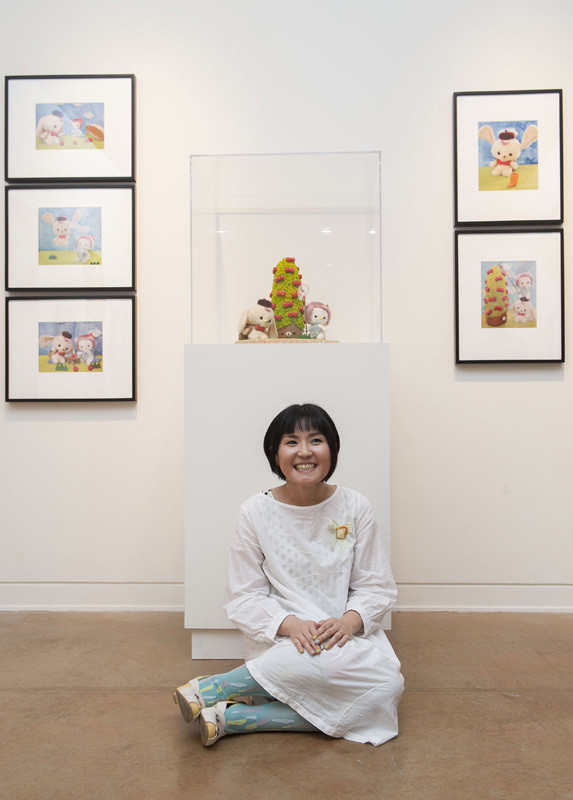 Eimi Takano sits in front of her plush sculpture, Ribbon Camp. While in the gallery, you can enhance your experience of this multifaceted exhibition with our exclusive Guide by Cell audio tours, available free of charge (except those that may be associated with your cell phone plan). The tours feature curator Christine Yano and several of the exhibiting artists offering their unique perspectives on the exhibition. Simply look for the cell phone logo on selected labels in the exhibition and dial 213.455.2924 to access the tours. Follow the prompts and enter the numbers given on the labels. Still thinking about the exhibition after your visit? Or, not in Los Angeles but still curious to learn more? The great thing about these tours is that they are accessible from anywhere. Just visit our Hello! Extras page to access the phone number and the complete list of prompts. The Hello! audio tours are available through April 26, 2015. This replica of the first-ever Hello Kitty product, a 1975 coin purse, will be on view at JANM as part of Hello! Exploring the Supercute World of Hello Kitty. There is more to Hello Kitty than cute stuff. An entire body of lore lies behind the origins and development of this global phenomenon and her parent company, Sanrio. These stories are familiar to devoted Sanrio enthusiasts, but if you are a relative newcomer to this world, read on to learn some fascinating, and surprising, tidbits. The globally known maker of cute products began its life as Yamanashi Silk Center Co., Ltd., founded in 1960 by Shintaro Tsuji. Its direction began to change due to the popularity of a simple rubber beach sandal decorated with a flower. Tsuji realized that the addition of a decorative element like a flower or strawberry could transform a simple dry good into a value-added, branded product. Sanrio—whose pleasant-sounding name was inspired by the Spanish words for “pure river”—was born soon thereafter. In honor of Sanrio’s origins, Shibori Girl Glennis Dolce will lead a one-day, Hello Kitty-themed silk-dyeing workshop at JANM on Saturday, December 6. 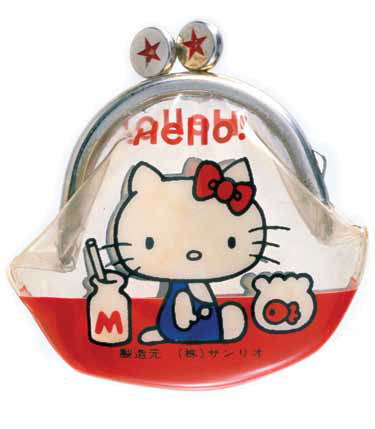 The Hello Kitty character first appeared on a small, clear vinyl coin purse in 1975. The purse was priced at less than a dollar. Although many replicas have been made over the years—including a recent makeup bag by Sephora that pays homage to the iconic piece—only one of the original purses is known to exist, and it is kept in a secure vault at Sanrio’s headquarters in Japan. This fall, Hello Kitty fans will be able to view the legendary coin purse when Sanrio flies it in for display at the first-ever official Hello Kitty Con, taking place at The Geffen Contemporary at MOCA October 30 through November 2. In addition, a replica of the original purse (pictured above) is included in JANM’s Hello! 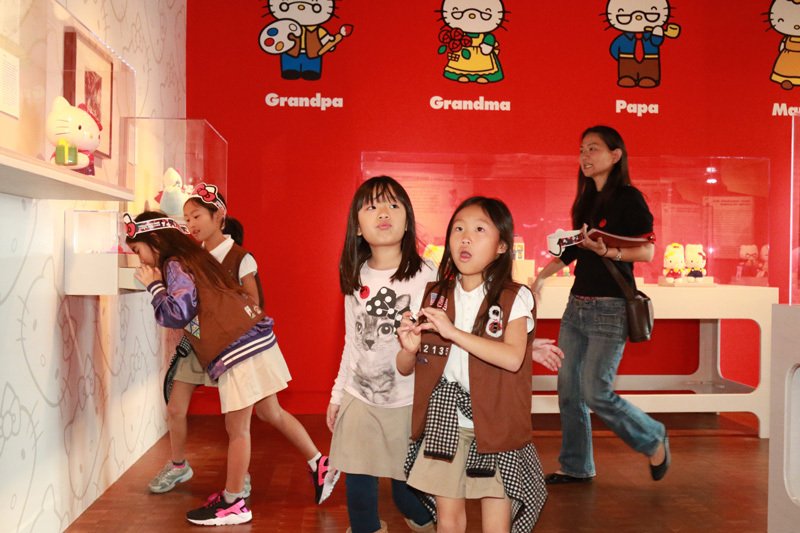 Exploring the Supercute World of Hello Kitty exhibition. During a busy holiday season in 1975, a Sanrio store clerk was wrapping a purchase for a customer when she discovered that she was out of bows. Quickly improvising, she decided to use a small bell that she picked off the store’s Christmas tree. The customer was so delighted with this little bonus that he left the store with a big smile on his face. Happy with this result, the clerk started adding bells to all wrapped gifts. When Sanrio founder Shintaro Tsuji heard about this, he made it the company’s policy to give out a small gift with every store purchase. You can learn more about Sanrio’s “Small Gift, Big Smile” philosophy at a panel discussion with Sanrio representatives on Thursday evening, November 20. Enjoyed these stories? More fun discoveries are coming your way beginning October 11, when JANM opens Hello! Exploring the Supercute World of Hello Kitty. View 40 years of Hello Kitty artifacts, 40 contemporary artworks inspired by Hello Kitty, Hello Kitty outfits worn by Lady Gaga and Katy Perry, and much more. Timed entry tickets are available now! 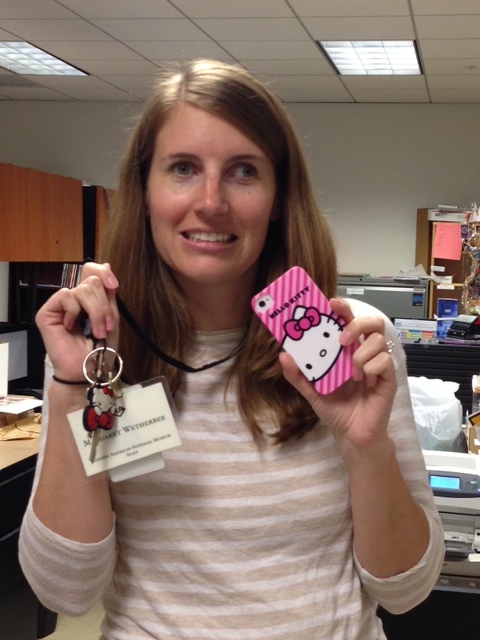 MariAnne is ready to welcome Hello Kitty fans to JANM! 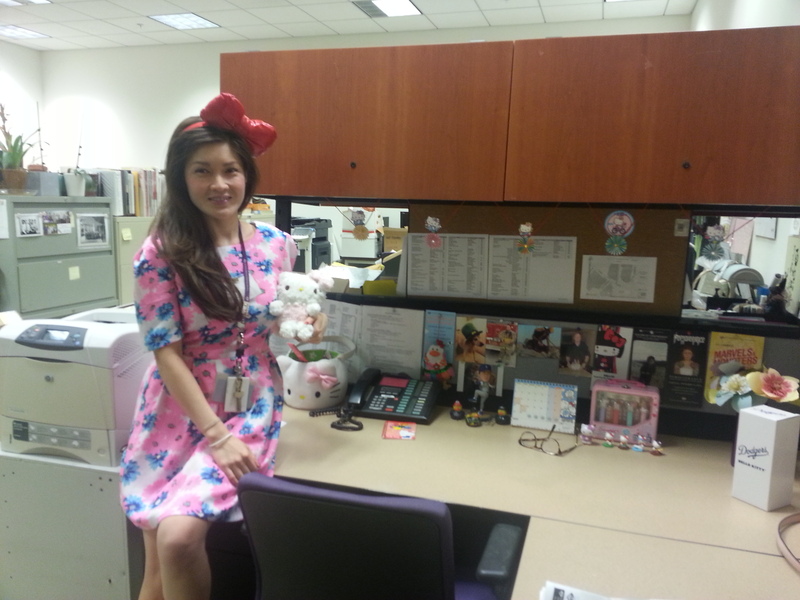 Hello Kitty desk décor, fashion, and flair are EVERYWHERE in our museum. There’s no denying that this group of hard-working professionals has caught a highly contagious case of Hello Kitty fever. We’re sure you will too when Hello! opens to the public on October 11, only four days from now! Reserve your timed entry tickets now using our online system! We look forward to seeing you all decked out in your own Hello Kitty finery. In the meantime, we’re getting back to work—there’s still a lot to do! 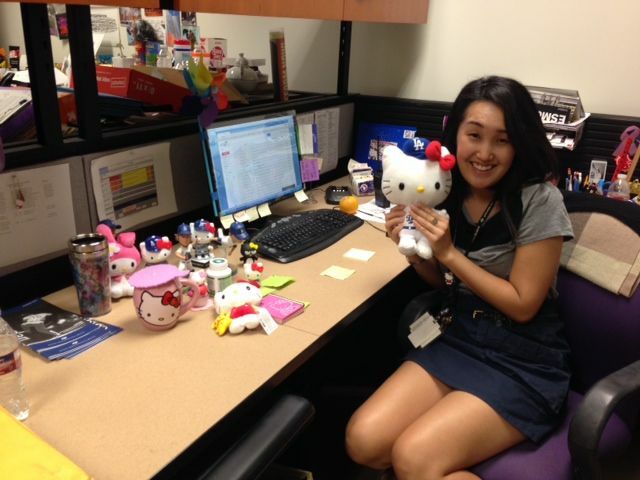 Liz shares a desk with Hello Kitty while planning a full schedule of public programs for the museum. 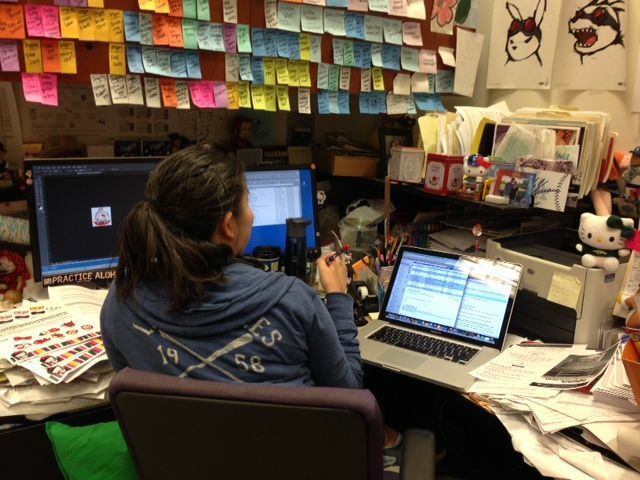 Hello Kitty has managed to squeeze in to Communications Production Manager Vicky’s busy desk. Look closely at the pen in hand! Lily even has a Hello Kitty clock to keep track of all those hours spent on curatorial research. 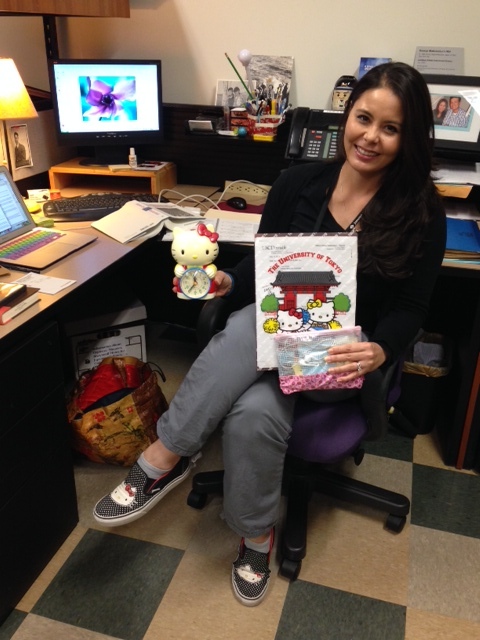 Leslie, Director of Marketing and Communications, demonstrates Sanrio’s “small gift big smile” philosophy. That looks like Communications Writer Carol, but we can’t be sure. 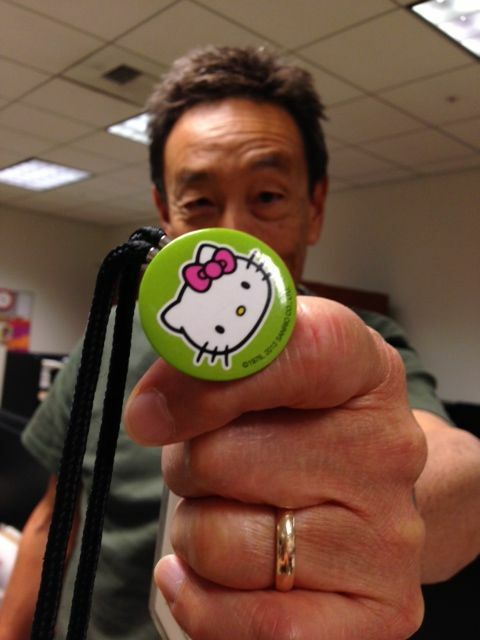 Even John, Director of Media Arts, can’t resist showing off a little Hello Kitty cheer on his JANM lanyard. 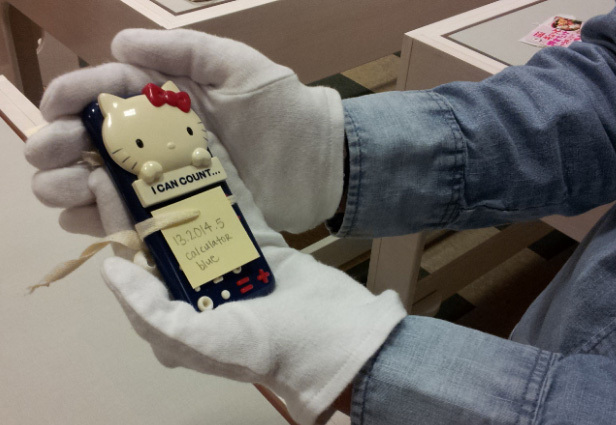 With Hello Kitty phone and key in hand at all times, Maggie has been working hard to make sure all the Hello Kitty art and artifacts make it to the museum safely. Want your own exclusive Hello Kitty gear? 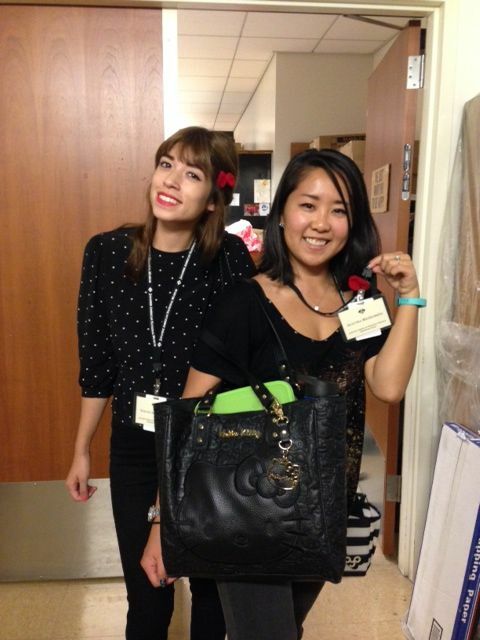 Store Associates Yvette and Alyctra are ready to help you with all your Hello Kitty x JANM purchases! JANM staff members have been working overtime to put together Hello! Exploring the Supercute World of Hello Kitty. The 40th-anniversary exhibition will be the biggest U.S. showcase for the popular cute icon to date, with 40 works of contemporary art and over 500 Hello Kitty artifacts. Many details of the show are top secret until the grand public unveiling on October 11, but with Sanrio’s permission, we are sharing these exclusive sneak peek photos with our loyal readers. 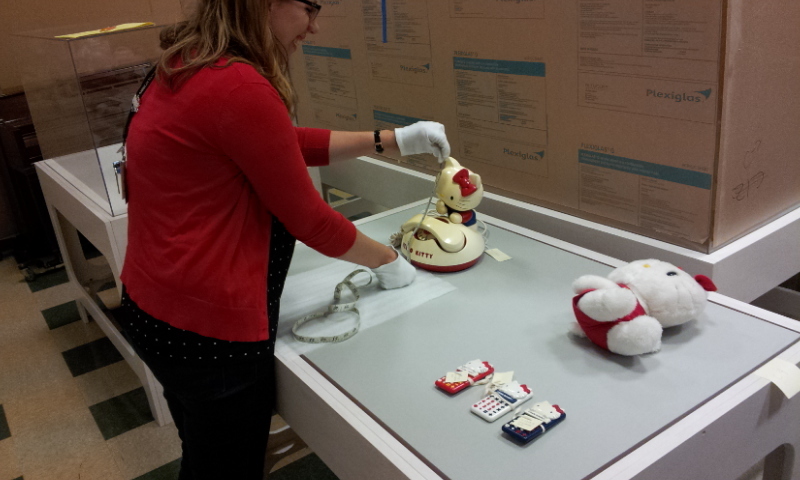 Archivist Lauren Zuchowski measures the first-ever Hello Kitty phone, made in 1976. 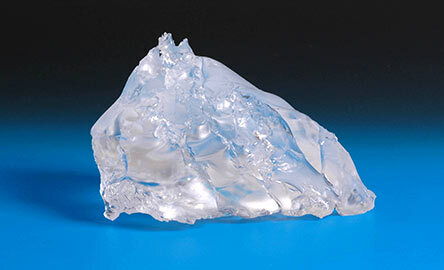 An object’s dimensions and condition have to be noted for the museum’s records before it goes on display. 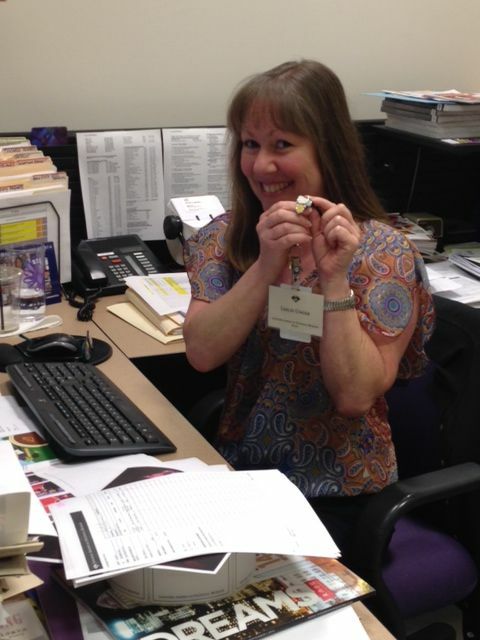 Collections Manager Maggie Wetherbee holds up a vintage Hello Kitty calculator, also from 1976. It still works! 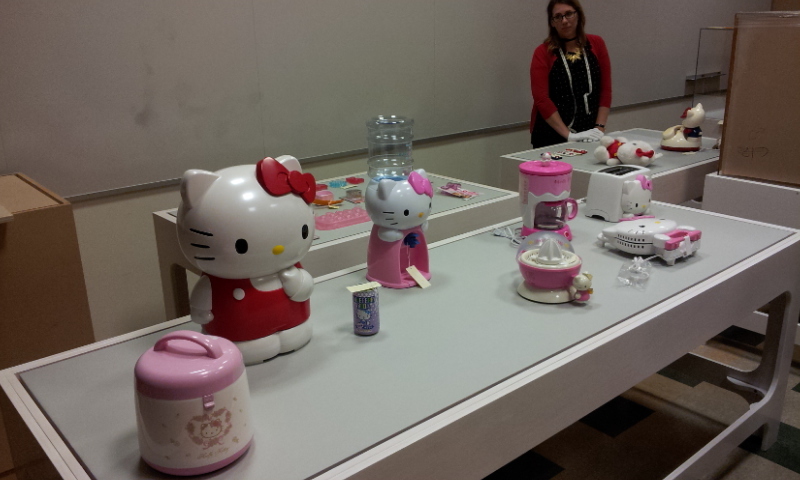 Sanrio has produced many Hello Kitty kitchen appliances over the years, often sized for younger cooks and diners. 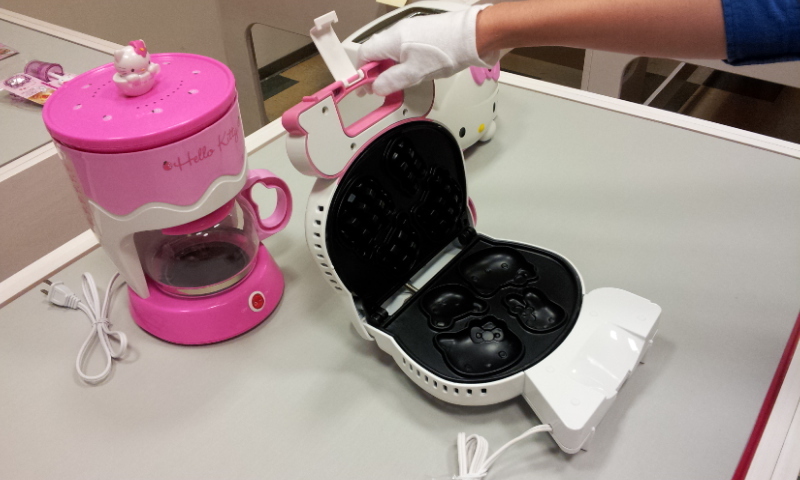 This Hello Kitty waffle iron makes kid-size Hello Kitty waffles in four friendly shapes. 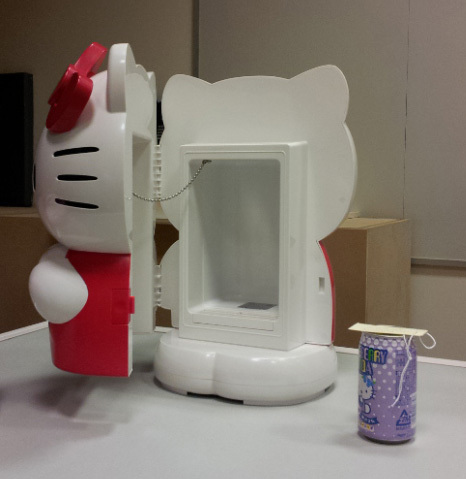 A Hello Kitty blueberry soda is a perfect fit for this Hello Kitty mini-fridge from 2007. Both products were made and sold in Japan. Here’s the first Hello Kitty artwork to be installed! 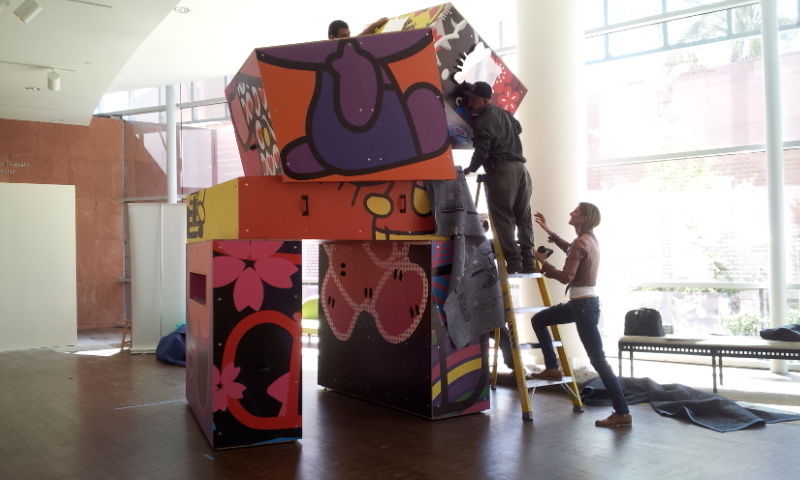 Artist Nicole Maloney looks on and offers direction as a team of handlers assemble her sculptural installation, Hello Kitty All Stacked Up!, in the Weingart Foyer. You can see these pieces and much more in person when Hello! opens on October 11. Remember, Hello! is a specially ticketed exhibition and we strongly recommend that you buy/reserve your tickets in advance by clicking here. JANM members get in FREE! 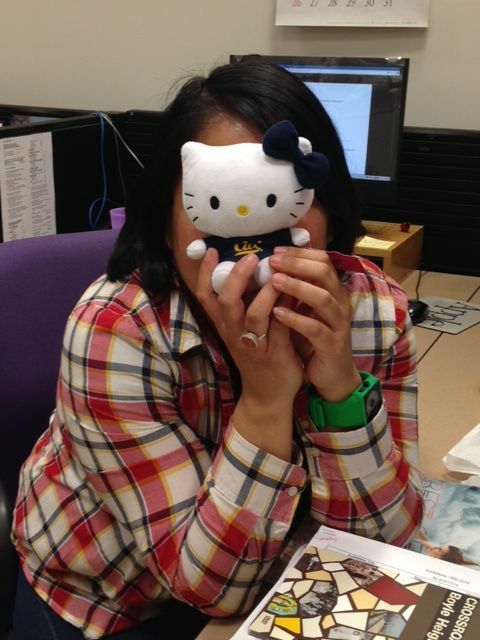 Stay tuned to our blog for more Hello Kitty news and tidbits over the next few weeks! 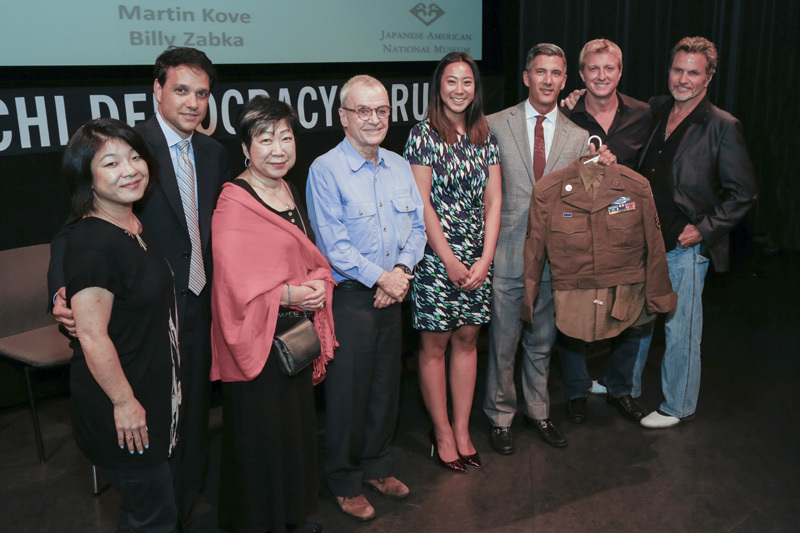 L to R: Aly Morita, Ralph Macchio, JANM Trustee Wendy Shiba, director John Avildsen, JANM New Leadership Advisory Council president Kira Teshima, JANM President and CEO Greg Kimura (holding “Mr. Miyagi’s” WWII uniform), Billy Zabka, and Martin Kove. Photo: Russell Kitagawa. 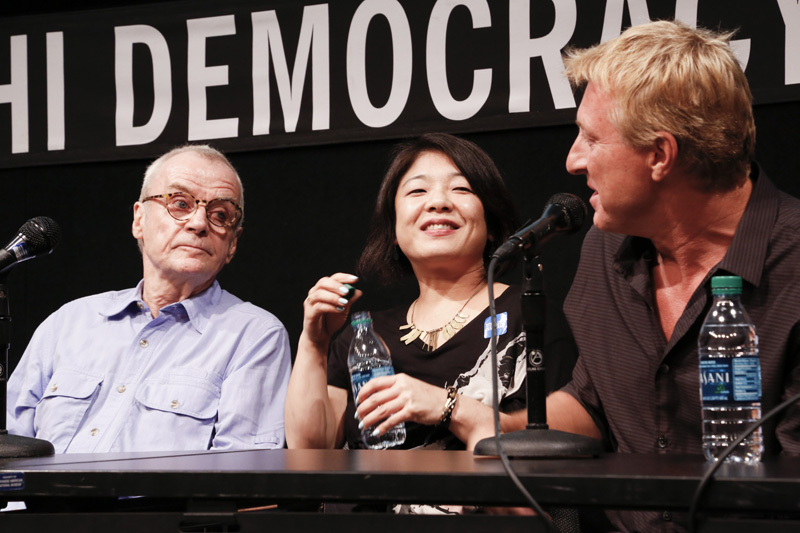 The Tateuchi Democracy Forum welcomed a full house on Tuesday, September 9, as JANM celebrated the 30th anniversary of the beloved film The Karate Kid with a reception, screening, and panel discussion. This highly anticipated event featured live appearances by star Ralph Macchio, director John Avildsen, Aly Morita (daughter of deceased star Pat Morita), and co-stars Billy Zabka (“Johnny Lawrence”) and Martin Kove (“John Kreese”). Among the guests in the audience were Tamlyn Tomita, star of The Karate Kid II; JANM Board of Trustees member Wendy Shiba; and JANM New Leadership Advisory Council president Kira Teshima. Many avid fans of the movie, some of whom had seen it when it first came out in 1984, were in the audience. During the screening, people clapped wildly for classic scenes, such as Mr. Miyagi protecting Daniel from the gang of teenage boys, and Daniel executing his tournament-winning crane kick. panel discussion. Photo: Russell Kitagawa. Jared Cowan, a photographer who recently wrote a cover story about The Karate Kid for LA Weekly, moderated a Q&A session following the film. The stars and director reminisced about the making of the film while Aly Morita shared her childhood memories of her father. The panelists also brought the film’s martial arts choreographer, Darryl Vidal, to the stage for an extended explanation of the iconic crane kick. While inspired by classic martial arts moves, the kick itself was specifically created by Vidal to heighten the drama of the climactic scene. JANM volunteer Richard Murakami spoke for many in the audience when he offered a heartfelt thanks to the group for creating a sensitive portrayal of a Japanese American man during a time when such portrayals were rare. “It made me proud,” he said, generating a round of applause. To see more photos from the event, visit JANM’s Facebook page. Keep an eye on our YouTube channel for video highlights of the evening, coming soon.